Mix the chicken keema, turmeric, red chili powder, cumin powder, coriander powder, salt, garam masala, cilantro and lemon. Keep it aside for some time for marination. Take a deep bottom pan and heat 2 table spoons of oil. Add bay leaves, cloves and cinnamon stick. Then add onions and green chillies for 2 minutes. Then add ginger-garlic paste and fry till it loses its rawness. Add chopped tomatoes and salt. Close the lid and let it cook for few minutes. When tomatoes become soft add coriander powder, red chilli powder, pulao masala powder (if you have it) and haldi. Cook for few more minutes and then add the chicken keema. Cook well till it loses all the moisture and starts leaving oil. Then add soaked rice and peas. Fry for few more minutes and then add water. Close the lid and cook in medium flame. Keep stirring in intervals. 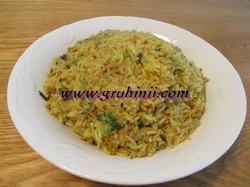 When rice is on the verge of almost cooked, add two spoons of ghee and nicely chopped cilantro. That's it. Try it out and hope you'll like it.